Thank you for deciding to submit your paper to Advances in Pediatric Research. Please make sure you have satisfied the points on the following checklist before submitting your manuscript. If you are submitting a manuscript to a particular Thematic Series, please refer to its specific name in your cover letter. Please make sure to read and follow the detailed Instructions for Authors for Advances in Pediatric Research. Please make sure to provide a cover letter with your submission, explaining why we should publish your manuscript and elaborating on any issues relating to our editorial policies detailed in the Instructions for Authors, and declaring any potential competing interests. Please make sure to provide the contact details (including email addresses) of at least two potential peer reviewers for your paper. These should be experts in your field of study, who will be able to provide an objective assessment of the manuscript’s quality. Any peer reviewers you suggest should not have recently published with any of the authors of your manuscript and should not be members of the same research institution. As this journal operates double-blind peer review, the title page should be uploaded separately, and not included in the main manuscript file. Tables less than 2 pages (about 90 rows) should be included at the end of the manuscript. 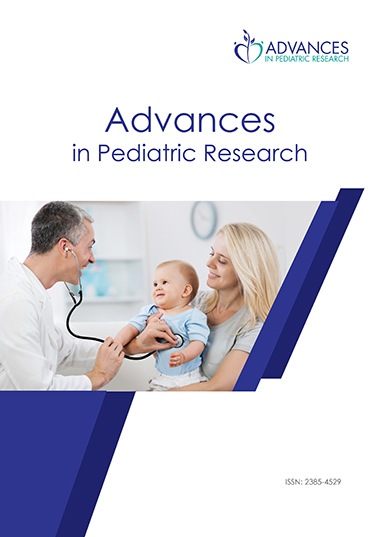 An article publication fee of is payable per Original and Review article and per Case Report, Editorial or Commentary accepted for publication in Advances in Pediatric research. This fee may be waived, depending on your country, as indicated in About this Journal. The fee must be paid prior to publication. 6. Are you one of the authors of this article? If not, you cannot submit the article on behalf of the authors. The submitting author takes responsibility for the article during submission and peer review. Do you confirm that all the authors of the manuscript have read and agreed to its content, that readily reproducible materials described in the manuscript will be freely available to any scientist wishing to use them for non-commercial purposes, and that you have ethical approval for any human or animal experimentation (for more information see our Instructions for Authors)? Do you confirm that the manuscript is original, has not already been published in a journal and is not currently under consideration by another journal? By clicking the button below, you are confirming these points.